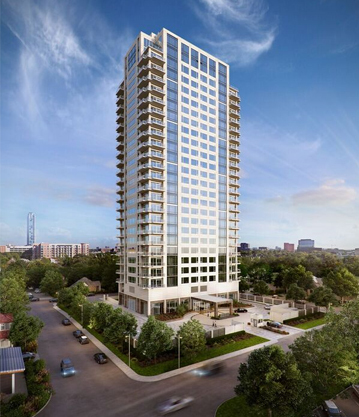 Prominently positioned in Houston’s exclusive River Oaks area and just two blocks from River Oaks Boulevard, Villa Borghese will rise 26 stories and contain only 46 residences. 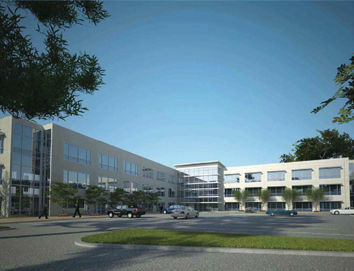 Residences will start at approximately 4,820 sq. ft.; each residence will have 2 expansive corner terraces. All homes will boast 11ft. ceilings in all living areas with spectacular views of Houston’s skyline. Each residence will have its own private entry lobby served by 2 high-speed dedicated elevators. Additionally, there will be 2 magnificent penthouses each with 2 stories as well as 2 oversized corner terraces. A separate service elevator will make deliveries and services easy and convenient. The building will feature a spectacular lobby with a 24-hour concierge, intimate gardens, a dog walk, an elevated pool and loggia area as well as concealed underground parking, an Interfin trademark. 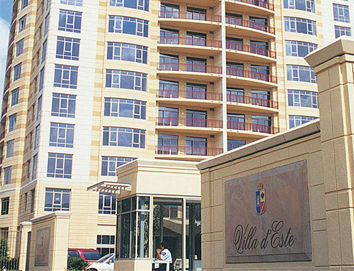 With only 2 units per floor, the Villa Borghese lifestyle will exude privacy, exclusivity and opulence. 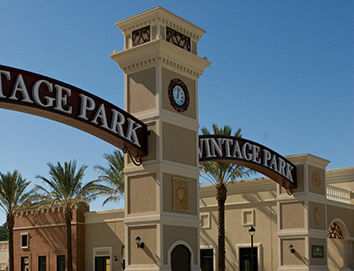 Service and management functions, along with deliveries and construction-related activities will access Villa Borghese through the monitored and secured service entrance located at the back of the property. This will allow any service operations to be performed in a dedicated area with utmost efficiency and smoothness. The service area is totally separate from the main entrance, ensuring privacy and elegance in the building's lobby. Access to Villa Borghese's plaza will be discreetly restricted by a security professional. 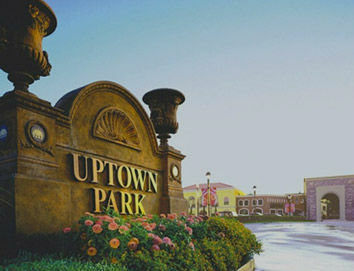 Guests will park at street level, adjacent to the building while residents will park underground on one level. Of course, 24-hour valet service will be at the disposal of residents and guests. The grand elegance of the building will be seen in the lobby of Villa Borghese. Serenely and privately located behind the building but elevated by one level, will be a recreational and relaxation landscaped area with a heated swimming pool and whirlpool. Outdoor gatherings on the ground floor will be directly connected to the expansive and elegant party room complete with a service/bar area and caterer's kitchen. On the second floor overlooking the lush gardens and pool will be the athletic club, with state-of-the-art equipment. Ladies and gentlemen's locker rooms will feature showers and a steam bath. Every residence will have an ample storage unit, easily accessed by the service elevator. 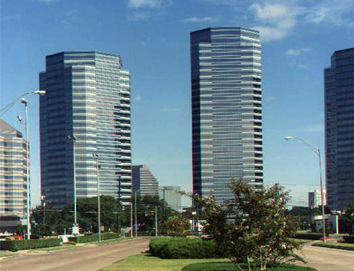 “Our vision is to create an architectural expression in a serene and exclusive setting that will become a Houston landmark and set the uppermost standard for high-rise living." 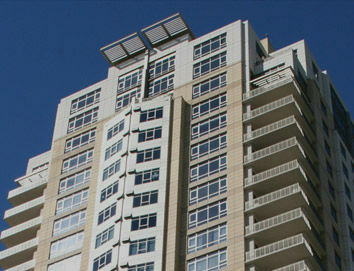 Belfiore is the culmination of Interfin’s experience in creating the most extraordinary high-rise condominiums. 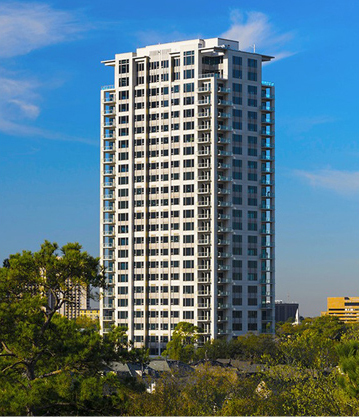 Situated in a rare environment that is at once private and tranquil, and yet integrated into Houston’s vibrant Uptown area, Belfiore pushes the boundaries of 21st century construction and luxury urban living. In designing Belfiore, Interfin sought to maximize spaciousness, elegance, and exclusivity. Boasting the largest floor plans of any residential complex in the city, Belfiore soars 26 stories, and features only two residences per floor. Homes start at approximately 4,650 square feet, and are adorned with two expansive corner terraces, a private entry lobby, and are served by two high-speed passenger elevators. At Belfiore, every detail has been meticulously considered: from spacious 11-foot ceiling heights to floor-to-ceiling windows that accentuate magnificent cityscape views. The concealed underground parking garage, all on one level, provides easy access to centrally located elevators that link directly to each home’s private entry. This ensures the privacy essential to such a prestigious building. Above all, there is convenience and unparalleled service in a secured setting, guaranteed by our commitment to quality construction and management. 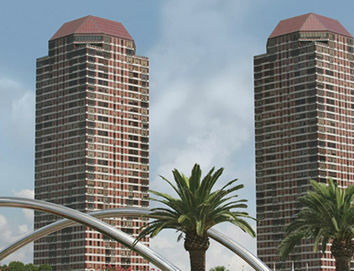 Interfin inaugurated the Granduca Hotels brand in 2006 with the opening of Hotel Granduca Houston. Echoing the classical grace of a private Tuscan villa, Granduca Houston has gained a sterling reputation among Houston locals and world travelers alike. Looking to expand the Granduca Hotels brand, Austin was selected as the ideal location for a second hotel. A key consideration was the manner in which Austin’s climate and atmosphere evoke the acclaimed Granduca experience. The vision for Granduca Austin was to embrace the majestic Hill country with an Italian twist, which led Interfin’s development team to a magnificent 38-acre green space marked by lush hills and expansive views on the west side of Austin. Thus Hotel Granduca Austin was born. 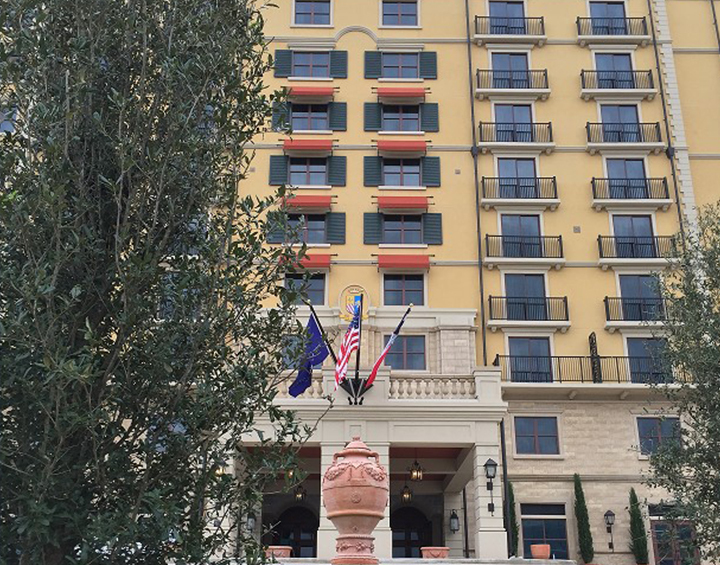 Standing as Austin's newest luxury boutique hotel, Hotel Granduca Austin opened in Winter 2015. The hotel offers upscale Italian ambience with breathtaking vistas and delivers exceptional guest service. 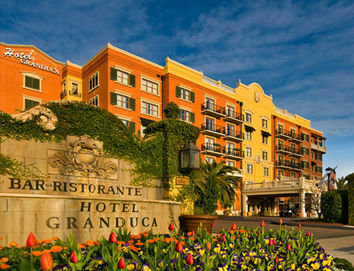 With 194 guest rooms and suites, Granduca Austin offers exquisite accommodations and classic Italian dining. The result is a one-of-a-kind experience in a magnificent setting only minutes from the hustle and bustle of downtown Austin. Highlights within Hotel Granduca Austin include a serene second floor saltwater pool and luxurious lounge area as well as a convenient spa offering a range of services. Salone Ducale, is an expansive and elegant event space adjacent to the hotel’s central Courtyard and Veranda. Ristorante Visconti offers authentic Italian cuisine. The Billiard room is adjacent to the lobby and bar area with additional cozy seating. Bar Malatesta a favorite for all guests features indoor and al fresco seating with cozy a fireplace which opens to both areas. In short, Hotel Granduca Austin much like its sister property Granduca Houston offers a departure like no other in both metropolitan cities. The two properties are the only hotels in Texas to receive the prestigious “Leading Hotels of the World” designations. 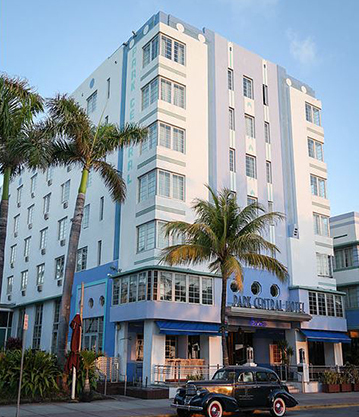 Interfin, along with Park Central Partners has acquired and is refurbishing the iconic Park Central Hotel in South Beach on Miami's famous Ocean Drive. Plans include a $20 million upgrade to the chic art deco hotel which has 125 rooms and suites. In addition, an upscale Italian restaurant, a magnificent rooftop pool and additional suites are in the plan – when completed the Park Central Hotel will boast a total of 135 rooms and suites all overlooking Ocean Drive and steps away from the Atlantic Ocean.